Tis the season to begin to awaken from our winter slumber. Follow the pontz boys along on one of our first clean-outs of the year. 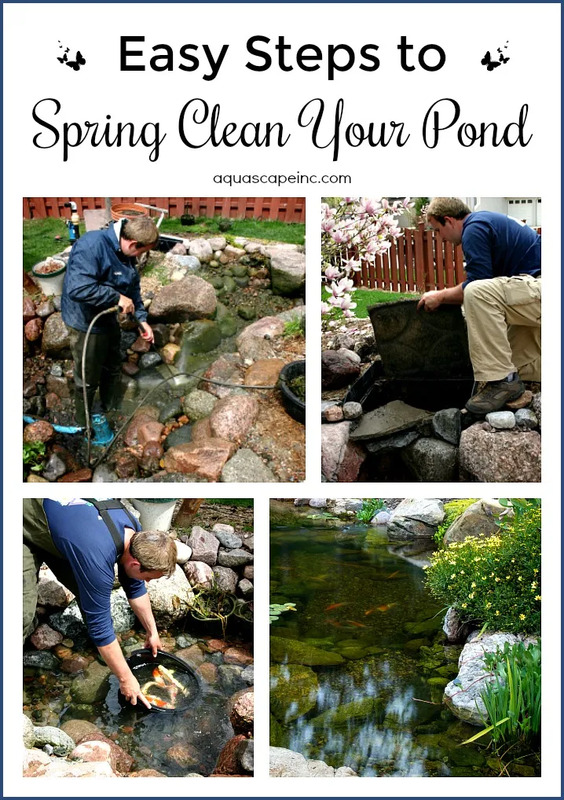 After you watch that AMAZING VIDEO check out the blog post below featuring all the tips and tricks you need to complete a successful spring pond clean-out. Spring is simply the most exciting time of year. Birds return from their southern migration, furry critters waken from their winter slumber, trees are budding, and your pond fish are stretching and warming up their fins for summer swimming! The best thing you can do for the health of your pond this season is to clean your pond – whether it’s a deep cleaning or just a bit of sprucing up. Take a good look at your pond and ask yourself, “Does my water feature need a full clean-out this season, or does it just need to be tidied up a little?” To help you decide, it’s worth knowing what to look for. First, if there is a layer of “crud” at the bottom of the pond and the water is dark in color, it would be a good idea to do a full clean-out. On the other hand, if there is just a small amount of debris that you can stir up and capture with a net and the water looks clear, a little tidying up is all that’s in order. If you’re going the full clean-out route, plan on spending a half to a full day to complete a pond clean-out. A Pondless® Waterfall will take considerably less time. You can, of course, hire a pond pro to clean your water feature for you. The best time to perform a pond clean-out is the early spring, before your water garden completely awakens from its winter dormancy – ideally before the water temperature in the pond creeps above 55º F. If a clean-out is performed when the water is warmer, after bacteria colonies form, the balance of the ecosystem will be thrown off and your pond will go through another period of algae blooms before the bacteria colonies become re-established. Be patient, your pond will naturally balance itself provided you don’t have a fish overload. Place the clean-out pump in the deepest point of the pond in order to remove the water. Don’t try to scrub all of the algae away. Some algae on the rocks will prove beneficial in developing your ecosystem. For an average size pond (11? x 16?) this should take around 15 minutes. Remove any debris from the bottom of the skimmer. This can be done by hand or by using the cleanout pump. Remove the media nets and filter pads from the BioFalls® Filter. If you have the optional drain kit attached to your Signature Series™ BioFalls® Filter, you can open up the valve and rinse the media and filters. Once the filters have been removed rinse them free of accumulated debris. After filling the pond with your garden hose, add Aquascape Pond Detoxifier to the water so it is safe for your fish. Dip a five-gallon bucket, or similar sized container, in the fish holding tank and fill it with water. After you’ve caught a fish, place it in the bucket and set the buckets in the clean pond water (this prepares the fish for the temperature of the pond water). By now, the temperature of the pond and the bucket water should be close to the same. You are ready to gently release the fish into their spring-cleaned home.